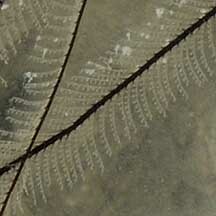 Where seen? 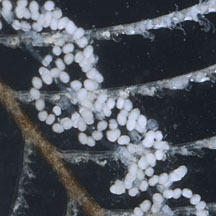 This colony of tiny animals is seen on some remote Northern shores. 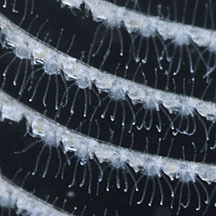 Divers may also encounter large colonies of this animal in the Southern islands. 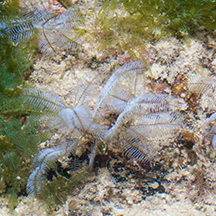 It grows on coral rubble. 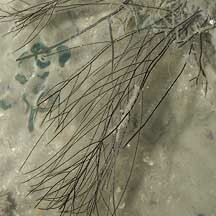 Features: Black thin branches (4-20cm long) with white feathery side branches. 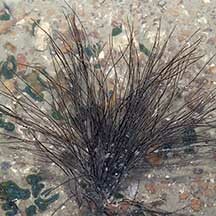 Some look like clumps of grass with long, sparsely branched or unbranched stems (10-20cm). 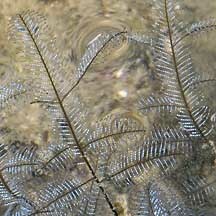 Others are bushier with stems that have more branches and fern-like structures (1-3cm long). 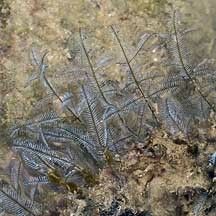 Burning feathers : These hydroids can inflict painful burning stings that take a long time to heal. Even a slight brush against it with bare skin will cause an immediate fiery reaction, raising painful welts that eventually itch for a long time. 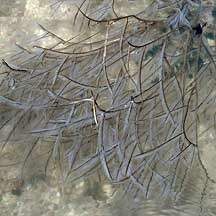 How to stay safe: Wear covered shoes and long pants to cover all skin exposed to water. 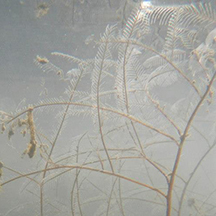 Do not touch hydroids. 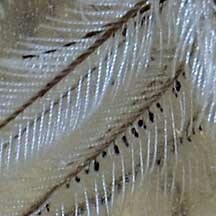 Macrorhynchia philippina has white feathery branches that pack a powerful sting. 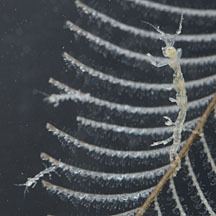 Hydroid friends: Despite their stings, sometimes, tiny animals can be found living among hydroids. 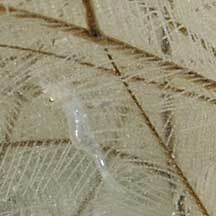 On this website, the animals are grouped by external features for convenience of display. Photo shared by Russel Low on facebook. 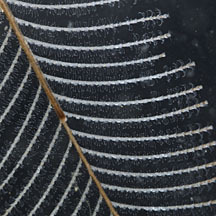 Macrorhynchia philippina (Leptothecata: Aglaopheniidae) White stinger by Claire Guérin, 2014, on taxo4254. 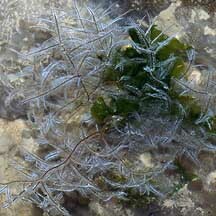 FREE photos of hydroids. Make your own badge here.